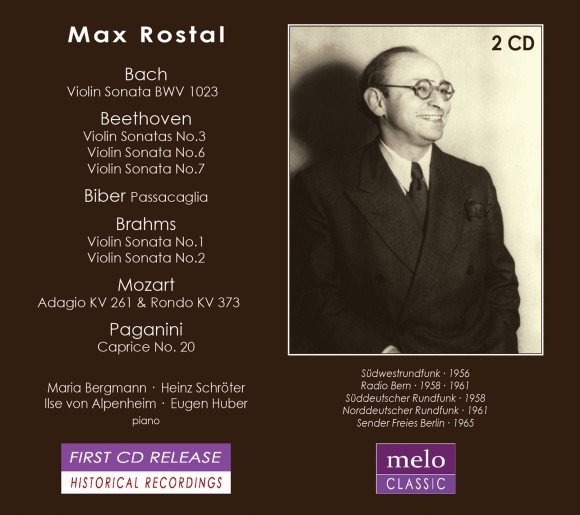 Max Rostal (1905-91) was a pupil of Arnold Rosé and Carl Flesch, whose assistant he became in Berlin. Though he kept fast musical company – he was part of a salon trio with Karol Szreter and Gregor Piatigorsky – he was not, in difficult cultural and economic circumstances, to earn pre-war renown. In any case, dismissed by the Nazis, he made his way to London where he was slowly to make his name as a performer and teacher. For a period he was particularly associated with the music of Britain – premiering and performing works by Bernard Stevens, Benjamin Frankel, Alan Bush and Robin Orr amongst others – and he played the Moeran and Elgar Concertos too. A number of broadcast performances have survived, and his pre-war Berlin discs have also received an airing. The full range of his wartime Decca sonata performances with Franz Osborn has yet to be fully investigated but should be. Which brings us to this twofer of radio inscriptions made in Germany and Switzerland between 1956 and 1965. His Brahms G major is full of gemütlich slides redolent of ingratiating Viennese charm which, allied to his slightly sentimental phrasing in places, delivered in his characteristically silvery tone, is certainly a very personal approach. So, too, is his sedate view of the sonata’s opening movement, ma non troppo being taken to the limits. His tone is somewhat dry – the opposite of opulent – and there are pinched, nasal moments along the way. Generally, his negotiation of some of the passagework is somewhat pedantic, and the reading as a whole rather lacks ‘lift’. Maria Bergmann plays well throughout. The A major suits him better temperamentally, one feels, and his tempi here are up to the mark. Maybe the fact that his regular chamber partner Heinz Schröter was on hand helped. There’s still a bit of tremulous phrasing but far less gesturing. The Beethoven Sonata (the C minor, No.7) with Schröter reminds one of his Osborn 78rpm set – he also recorded for Decca another Beethoven sonata, namely No.6. It also reminds one of Rostal’s enduring book on the Beethoven Violin sonatas. Apart from a few trifling imprecisions the main impression is of a ruggedly imperfect, strongly hewn reading which has vitality and structural insight. Sometimes Rostal’s playing on record could sound coolly detached and tonally uningratiating; I wouldn’t say he’s exactly tonally refulgent here but his phrasing is freer here than was often the case in the studio. No.6, from a date in Bern the month before, is perhaps even better, with the variations very adeptly characterised. The last of the three Beethoven sonatas in this set is Op.12 No.3 where he’s accompanied by Ilse von Alpenheim – who was later to marry Antal Doráti. Spirited engagement rather than scrupulous clarity marks Rostal’s performance; the Rondo finale especially so. He and Eugen Huber conjoin Mozart’s Adagio in E major and the Rondo in C major; the portamento-heavy pre-war ethos of the former contrasts with the lighter, brighter Rondo. His Paganini Caprice is piano-accompanied in Old School fashion. A 1958 recital with Lothar Braddack finds earlier repertoire in the shape of Bach and Biber. This is a very rare surviving example of Rostal’s Bach and is worth auditioning his musicianly and adept playing; still more, really, the solo Biber, which is impressively surmounted and architecturally cogent. The recorded sound of these disparate recitals is excellent as is the documentation.